In the first half of March everything is relatively plain sailing. Mentally there can be friction and arguments, but that doesn’t hamper the forward drive. On the contrary, it can even propel the motivation to act and to drive projects forward. Having a keen eye for details continues to remain of importance. Jupiter in Scorpio goes retrograde on the 9th, thus heralding a new phase about one’s own values, ideals and spiritual orientation during a four-month contemplation and review. Where did I want to go and where am I now? Is it headed in the right direction and, if not, what can I do to change that? However, the time to act has not yet begun, and the first necessary step is an assessment. In the second half of the month, this trend becomes even more pronounced, because decisions made during retrograde Mercury are premature – of course, powerful sweeping blows even more so! It is better to examine the situation, to scrutinise and determine one’s own thinking patterns and emotions: What do I know already, and what else do I want/need to find out? Discussions support the process, but this exploration will wear on for several weeks, so don’t get impatient! In April the tide turns. And from May onward it will be really exciting. Then a lot of things turn into their opposite anyway! 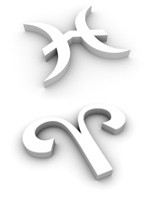 Aries: In March, the best way to proceed is for you take a playful and experimental stand. Otherwise, you’ll be again and again tossed back and forth between Stop! and Go! Venus will accompany you in the first half of the month. Give your energy in particular to reliable relationships and friendships. Preparatory talks for your activities should take place now. Negotiations ought be concluded in the second half of March; you will find a clearer direction and it is a matter of purposeful action. Taurus: A gentle start to the month. From the second week on, the pace picks up and demands increase. Face them, but stay in touch with other people. Share and work with them to find solutions to difficult situations. In order to do so, it is also necessary that you open yourself up to new points of view and are ready to try out new ways. Getting support requires willingness to accept it. If you insist on doing everything in the same way as before, everything will stay the same. Gemini: It’s good that flexibility is your strength, because you will need it in March. In general, you should focus on solutions that are universally acceptable and not only provide pleasant results for yourself and your loved ones. Find out about the feasibility of your ideas and test them under different conditions. You are welcome to consider yourself a pioneer who is about to add revolutionary possibilities to the collective pool of thought. To do this, break through your own spiritual limits first. Be a maverick! Cancer: Like every year, this is the time when you find yourself torn between looking at the big picture and reading the fine print. There are no one-size-fits-all solutions, it’s rather about sensitive balancing in different situations. This requires precision and care, coupled with relaxed confidence and a knowledge of larger concepts. Anything that strengthens your confidence will help you find the golden mean in March. Hence, your steps will be practical and life affirmative. Leo: When the focus widens, clarity is reduced. March is about expansion. This means that you now have to put up with certain compromises about accuracy and conciseness. Awareness of this limitation allows you to move or delegate certain tasks. You have to shift yourself more to what demands release, relaxation and openness. These qualities are particularly required in human interactions. Patience, humour, optimism and altruism are the natural consequence. Virgo: In the first half of March, your most beautiful qualities can convene: a compassionate heart, the willingness to commit yourself to practical improvements and creating the circumstances for loving togetherness. As always however, there is the danger that because of your engagement in the outer world you will lose sight of your own interests. This is a danger because at some point you could become hard and embittered. Be kind to yourself and lenient about any possible mistakes! Nobody’s perfect. Libra: The first half of the month is a pleasant mixture of gentle flow, inner expansion and humanity, which is joined by dynamism and joie de vivre from the 7th onwards. It is not until mid-March that frictions arise, often at first triggered by misguided ambition or dogmatism. Later it can come to real power struggles. If you should get into something like this, act outwardly, but find inwardly that which remains untouched by conflicts. How do you do that? Stay with that inside yourself which perceives them. Scorpio: With three Pisces planets, it’s easy to flow with life. This can manifest itself externally by making things run smoother or also internally by being ready to let yourself be carried, no matter where life takes you. This does not exclude initiative, because it is also part of life. But then you don’t expect that everything has to develop according to your ideas. If it does, wonderful. If it doesn’t, also wonderful. Just make the best of every situation! Sagittarius: Use the first half of March to mobilise everything that needs energy, courage and spirit. During the course of the month you will notice that it becomes increasingly difficult for you to act powerfully and inspire others. That’s not a mistake. There are outwardly oriented time qualities and those directed inwards. You are at a turning point from the outer to the inner. Set up your life accordingly: Over the next 4 months, occupy yourself with questions about the meaning and value of what you are doing – seek and find answers! Capricorn: Your efficiency will continue to increase, and it’s still a good idea if you were to rely on that instead of deploying more and more velocity. You urgently need some counterbalance that allows you to relax and enjoy yourself. Only with this counterbalance can your full potential unfold. A purpose-free being, a playful attitude – mute your smartphone and let small children inspire you in a playground meditation. Simply watch them. Aquarius: A good month to start jointly with other activities or to carry them forward. The first half of March is particularly suitable for spiritual or other projects that widen the horizon. Let yourself be transformed – whether by other people, foreign cultures, innovative ideas or circumstances that require getting used to. The more actively you get involved, the better. In the second half of the month it is especially relationships or even artistic context that give you wings and inspiration. Pisces: Except for right at the beginning of the month there shouldn’t be any major challenges. The strong Pisces accentuation ensures that you can float as usual through all situations without exerting yourself excessively. In the first week your relationships are your biggest resource, while in the second half of the month you will find your power sources rather in the professional sphere. Weltschmerz is experienced also now and then, but this is a phenomenon that Pisces can deal with better than any other sign of the zodiac.